CHUB CHECKERS: Leeds members Paul Gallagher and Tony Hewson release hundreds of chublets at Aldwark Bridge. But will there be a twist with a few making the short swim to Topcliffe? 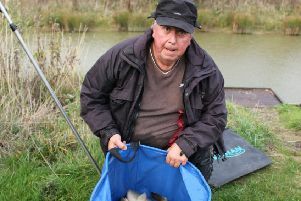 River Swale regulars’ hopes of help in restoring fish stocks on the seal-ravaged fishery at Topcliffe were dealt a massive blow last week as the Environment Agency refused to back calls for restocking. I found the decision hard to believe and was soon on the phone to Leeds and District’s fishery liaison officer, Dave Ruston, who was present at the meeting and in response wrote: “The Environment Agency advised that the devastation caused by the seal did not fall into their criteria for restocking and cited two main reasons. “Firstly, they don’t restock due to predation and they didn’t want to set a precedent at Topcliffe. “However, in my opinion, a lone, lost seal some 50 miles inland, living in a weir pool for three months, on one of the most popular barbel stretches in the North of England is hardly natural predation. “It is a very different and one-off scenario compared to the daily predation by the ubiquitous cormorant or the ever-increasing otter population. They had also visited the venue and seen barbel and chub over the Topcliffe Bridge. “Yes, fish are still present. We are not claiming the area has been wiped out completely. Anecdotal evidence shows a few isolated good catches of barbel and chub but catches across the board have been affected significantly. 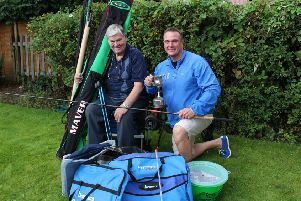 “I spoke to one Topcliffe regular and he told me that this time last year he’d caught 63 barbel from the stretch. This year’s tally was 22. Even taking the low river levels and hot weather into account, that is a massive reduction in catch rate. Personally, I don’t think the reasons add up. It’s only months ago the Environment Agency gave other parts of the same river system as the Swale a massive boost with juvenile fish supplied from its Calverton facility. I witnessed all the stockings, with the first on the Ure at Aldwark Bridge where over 1,000 pristine chub and barbel were released, soon followed with similar numbers into the River Nidd at Hammerton Mill, which, incidentally, are already providing sport for visiting rods. The general consensus among anglers was that these stockings were made as a result of cormorants, goosander and otters. The EA is, therefore, has not made a precedent for Topcliffe as it has already been set; there seems no logical reason for them not to change their minds. Armley AC at Redwood ARC: 1, B Palister 69-04; 2, D Fish 30-08; 3, J Hope 28-04; 4, A Faithwaite 25-02. Viking Saturday Open (Hawk): 1, N Rymer 78-02; 2, A Barker 57-07; 3, A Rymer 51-12; 4, K Sykes 41-09. Yorkshire Post AC (Viking Hawk): 1, I Askwith 89-06; 2, M Scaife 58-01; 3, A Heaps 41-00. Yorkshire Electric AC (Viking Hawk): 1, B Collier 74-03; 2, J Everett 53-12; 3, J Butler 49-01. Ferrybridge Power (Viking Hawk): 1, J Gerry 97-00; 2, I Hartland 91-00; 3, A Gascoigne 70-00; 4, A Wood 51-00. Upper Calder Championships: 1, A Miller 21-14; 2, T Earnshaw 18-02; 3, A Sugden 16-13; 4, D Pitt 16-09; 5, T Peters 15-12. White Horse AC at Forest Lane: 1, B Murgatroyd 34-10; 2, I Day 34-00; 3, P Smolka 33-00; 4, P Sharpe 30-06. Bradford No1 at Knotford Carp: 1, Curtis Hitchmough 120-10; 2, Reece Lisle 18-00; 3, David Jarvis 15-08. Woodlands Lakes at Thirsk: 1, N Whiteside 139-07; 2, K Pentland 139-04; 3, D Smith 119-04; 4, M Quance 101-13. Moor Monkton Pools: 1, Steve Mazza 113-00; 2, Chris Baldwin 92-07; 3, Andy Middleton 89-08; 4, Matt Gallagher 85-04. The Oaks at Sessay Cedar: 1, C Hall 100-03; 2, A Barker 81-14; 3, A Mitchell 78-00; 4, S Brunyee 77-06; 5, A Bull 70-04. Robin Hood AC at Swanlands: 1, D Webster 101-07; 2, M Firth 99-08; 3, M Webster 69-04; 4, B Dell 67-00. Bradford No 1 Calder League: 1, T Peters 29-03; 2, D Taylor 23-04; 3, C Turbitt 22-11; 4, P Bennett 17-10; 5, M Hope 17-00. Individual Aggregate: 1, D White 108-12; 2, C Turbitt 91-06; 3, D Armitage 89-00; 4, D Taylor 81-06; 5, F Prudham 73-05. JT Rodgers Round 20 at Southfield Reservoir: 1, D Jackson 27-12; 2, T Biggins 22-10; 3, D Watson 18-15. JT Rodgers Round 23 at Raker Acorn: 1, A Conboy 161-02; 2, S Phelan 74-02;3, D Shaw 67-10. JT Rodgers Summer Series, Final Standings: 1, A Jackson 143pts; 2, D Shaw 138pts; 3, D Watson 135pts; 4, S Phelan 119pts. Poppleton: Sunday Open, 50 pegs draw 11am Cafe, contact 07425 146677.